Discussion in 'iPhone and iPad Games' started by Echoseven, Jul 31, 2015. This is, hands down, the best city builder on the Appstore and it's entirely devoid of timers or iAP bullcrap. 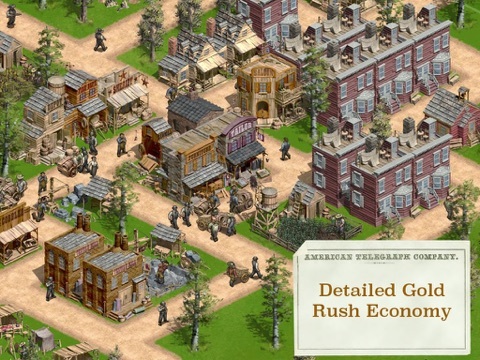 If you're searching for a town management game (a la banished but set during the Gold Rush) then don't hesitate and pick it up now! For the love of God... Where did this come from? That is game 38 in my swelling backlog. This has (well the original version) been on my watch list for so long. I think I'll finally pick this one up. I love city builders and to see one without timers is almost unheard of. Hi everybody, 1849 devs here! Just saw this thread. Thank you for the kind words! We've tried hard to make a good simulation game - we were huge fans of the Caesar series back in the day, so this is kind of an homage to that entire genre of games. 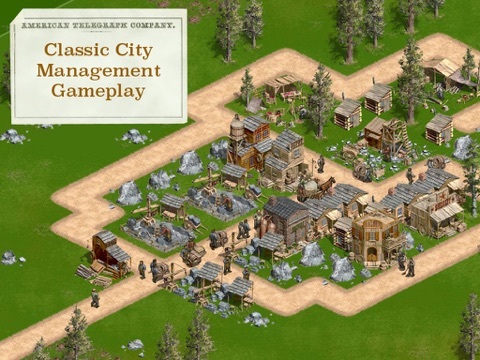 I really hope that premium strategy games will make a comeback on tablets - it's such a good form factor for playing strategy and simulation games! Oh nice!! Will be getting this one!! Game looks awesome, I will buy a download from app store later tonight Few questions if you don't mind. 1. How many devs were working on this game? 3. How long did it take to create it? 2. Budget was minimal - we lived off our savings while we made the game. 3. The whole thing took 13 months from start to release. 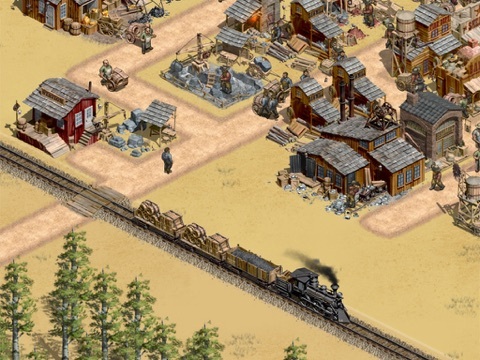 Plus a few months post-release to add things like mobile sandbox mode, and Nevada expansion pack. Unfortunately it's not a free game, and we don't have a trial version at this point. Maybe in the future...? How do I rate the game at the top. Wasn't asking if it were free I already bought the game. Just wondered if ther was a trial for other people who didn't want to pay $6 without trying first . Good thing to have . On the app there's a button in the upper right corner that says, "Rate It". Click on that and you can enter how many stars. On the web there's 5 stars right below the app icon of the game. Click on them and you can enter how many stars. Once you do either of those, your rating will show up next to your name. Enjoying this one so far. Pretty fun resource management and balancing city builder. First time noticing this and feeling very tempted by the game. I am not use to the theme but still, what's it like? Got the Steam version or Android not sure atm and liked the game. This looks pretty cool. For me it's hard to even imagine a city builder without timers. I'm not a PC gamer so I haven't played very many of these. Is this like Anno? You must earn income at timed rate? You're describing free to play wit a one time pay wall. Games tend to make zero dollars with that marketing strategy. The reviews seem pretty strong, maybe toftt and let us know your thoughts? He said he already bought the game. Wanted to know it there was a trial version for a friend. He wanted to rate the game because he already bought it. Played sandbox for a few hours and can confirm this is a great sim, and expect it to get positive reviews. Overal, it does a great job of esablishing a basic resource model that you manage to expand population levels. There are a few frustrations with the ui, but its generally intuitive. 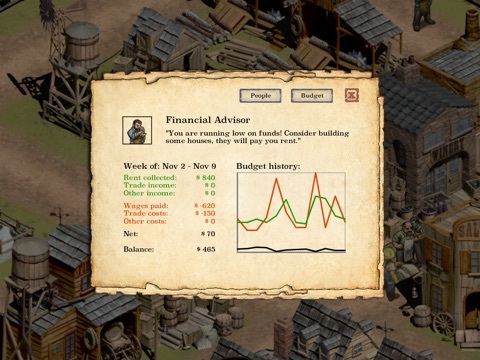 As far as the game, your ability to establish momentum is solely based on leveraging trade routes with neighbors, which is interesting, because you only get 4 neighbors and each of those only supply and demand one type of resource/good. Unless additional options open later in the game, this is a significant limitation, one which could be alleviated by a regional market-based economy, where you buy/sell from/to the market rather a specific buyer/seller. 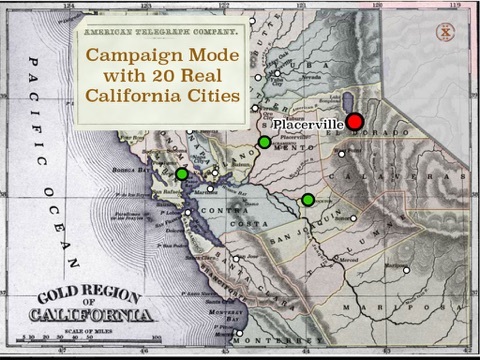 Also found it interesting that there is no railroad elements, which is surprising for the theme, because outside of gold, railroads were significant to the economy of the early west.